Non-enveloped, isometric, icosahedral, about 30 nm in diameter. Linear, C-rich, ssRNA(+) genome of 7.5 kb. The 3' terminus has a poly(A) tract. The virion RNA is infectious and serves as both the genome and viral messenger RNA. The genomic RNA encodes a large replication polyprotein which is cleaved. 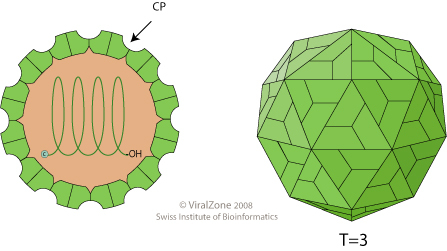 The capsid protein and two small proteins are translated from two or more 3'-coterminal subgenomic RNAs. TRANSMISSION Mechanical, vector=unknown. Not sap-transmissible.